Germany is increasing security at airports and railway stations in light of "concrete indications" of terrorist attacks being planned for the end of November. Interior Minister Thomas de Maiziere said it followed a tip-off from another, unnamed country. Germany had information on "sustained efforts" by Islamist extremists to carry out attacks, he said. He said the extra security would remain in place "until further notice". "There are grounds for concern, but not for hysteria," Mr de Maiziere told a news conference in Berlin. The federal police force has been ordered to step up checks at airports and train stations, he added. Mr de Maiziere said Germany had received a tip-off after two parcel bombs were intercepted en route from Yemen to the United States last month. One of the bombs was despatched via the German city of Cologne but was intercepted in the UK. The Yemen plot showed "the adaptability and the persistence of terrorists in pursuing their aims," Mr de Maiziere said, and also underlines "the reliability of some leads". Germany would not allow international terrorism to constrict its way of life or liberal culture, he said. Last year, twelve militants vanished from Hamburg, some to resurface in Northern Pakistan where at least one, but not all were killed in an American drone attack. Some of the new security measures would be clearly visible, Mr de Maiziere said, but others would not. The BBC's Stephen Evans in Berlin says that a month ago, Germany was dismissive of American warnings of attacks. That feeling has now gone. Germany, which has nearly 5,000 troops in Afghanistan, has never experienced an attack by Muslim militants. But officials say the country has a significant Islamist community, and militant links to Germany appear to be growing. For example, the key operatives who carried out the 9/11 attacks on the US in 2001 were based in Hamburg. 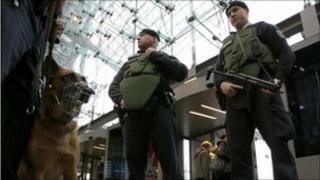 In July 2006 militants placed suitcases with homemade bombs on two trains at Cologne station. They failed to detonate.